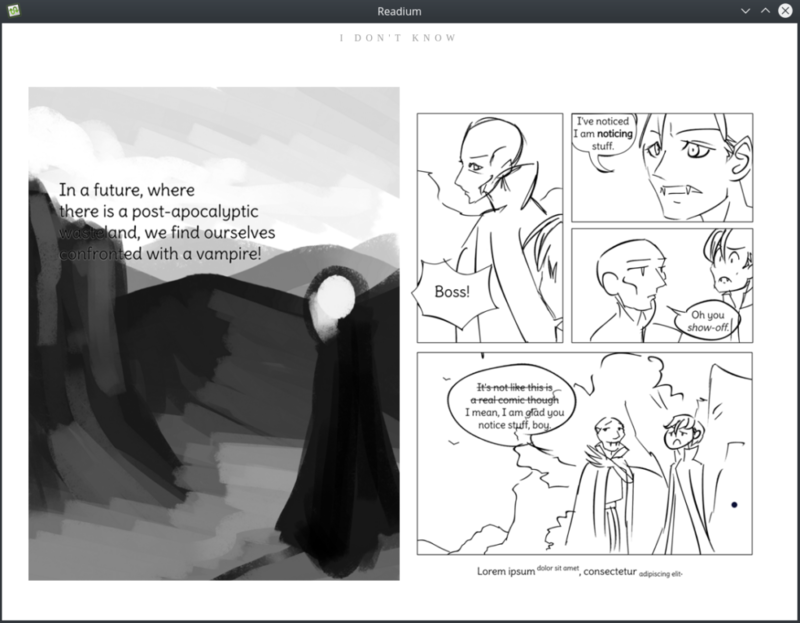 Today we’re releasing the latest version of Krita! In the middle of our 2018 fundraiser campaign, we’ve found the time to prepare Krita 4.1.3. There are about a hundred fixes, so it’s a pretty important release and we urge everyone to update! Please join the 2018 fundraiser as well, so we can continue to fix bugs! Now you might be wondering where Krita 4.1.2 went to… The answer is that we had 4.1.2 prepared, but the Windows builds were broken because of a change in the build infrastructure. While we were fixing that, Dmitry made a couple of bug fixes we really wanted to release immediately, like an issue where multiline centered text would be squashed into a single line when you’d edit the text. So we went and created a new version, 4.1.3! Krita 4.1.3 is a bug fix release, so that’s the most important thing, but there are also some new things as well. The first of these is the new welcome screen, by Scott Petrovic. You get some handy links, a list of recently used files, a link to create or open a file and a hint that you can also drag and drop images in the empty window to open them. Dmitry Kazakov has worked like crazy fixing bugs and improving Krita in the past couple of weeks. One of the things he did was improve Instant Preview mode. Originally funded by our 2015 Kickstarter, Instant Preview works by computing a scaled-down version of the image and displaying that. But with some brushes, it would cause a little delay at the end of a stroke, or some flickering on the canvas: BUG:361448. That’s fixed now, and painting really feels smoother! And for added smoothness, most of Ivan Yossi’s Google Summer of Code work is also included in this release. We’ve also done work on improving working with selections. 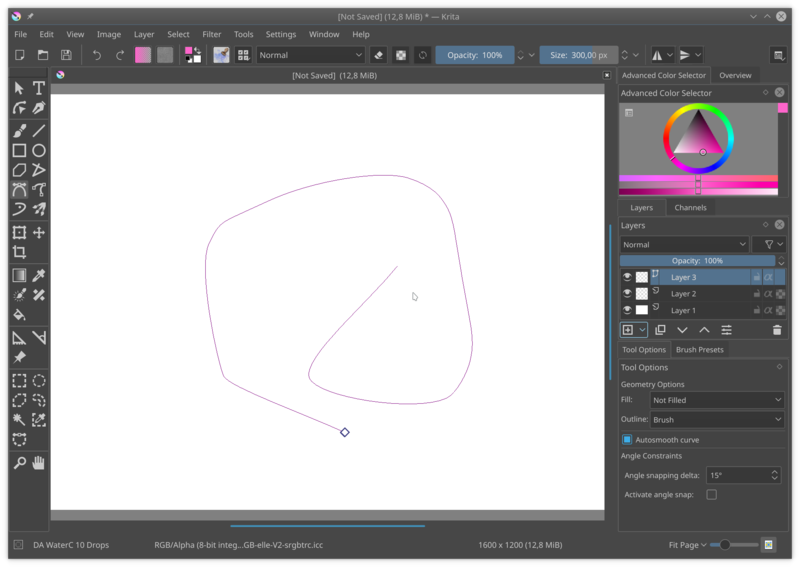 Krita’s selections can be defined as vectors or as a pixel mask. If you’re working on a vector selection, using the figure tools, like rectangle or ellipse now add a vector to the selection, instead of rasterizing the vector selection. The move tool has been improved so it’s possible to undo the steps you’ve set with the move tool, instead of undo immediately placing back the layer where it originally came from. See BUG:392014. The final new feature is round corners for the rectangle tool. 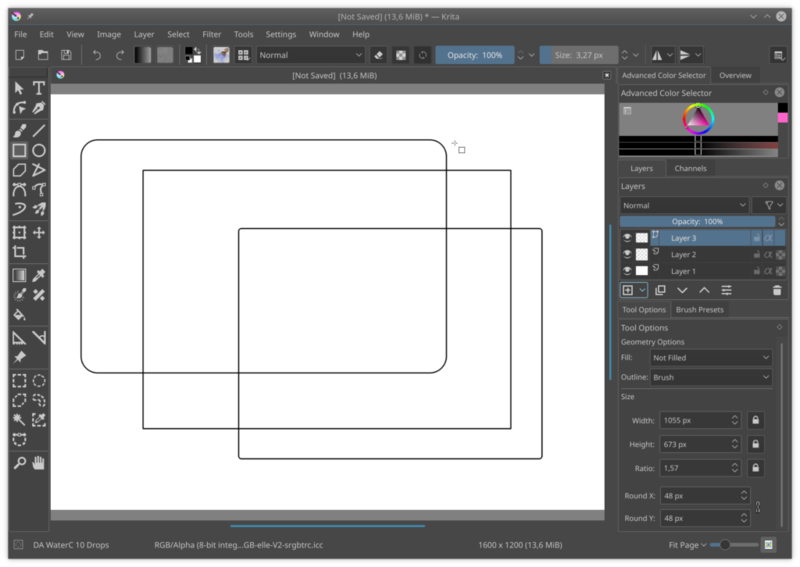 Whether you’re working on a pixel or a vector layer, you have an ability to set round corners for the resulting shape. BUG:335568. You could, of course, already round vector rectangles by editing the shape, but this is easier. Region navigation for panels and balloons, as per epub spec. A Pagelist in both nav.xhtml and ncx. Ensure generated EPUBs pass EPUB check validation. This invoved ensuring that the mimetype gets added first to the zip, as well as as some fixes with the author metadata and the NCX pagelist. Fix several issues with the EPUB metadata export. Add MARC-relators for use with the ‘refines’. Add UUID sharing between acbf and epub. Add a modiied and proper date stuff. Makes the balloon localisation more robust. Adds a ton of documentation everywhere. Make the generated EPUB 3 files pre-paginated. This’ll allow comics to be rendered as part of a spread which should have a nice result. Update ComicBookInfo and ComicRack generators. Restore the shortcut for the invert filters. Disable pixel grid action if opengl is disabled BUG:388903 Patch by Shingo Ohtsuka, thanks! Fix saving to a dropbox or google driver folder on Windows temporary workaround until QTBUG-57299: QSaveFile should be disabled on Windows. Fix color picking from reference images. Desaturation now affects the picked color, and reference images are ignored for picking if hidden. 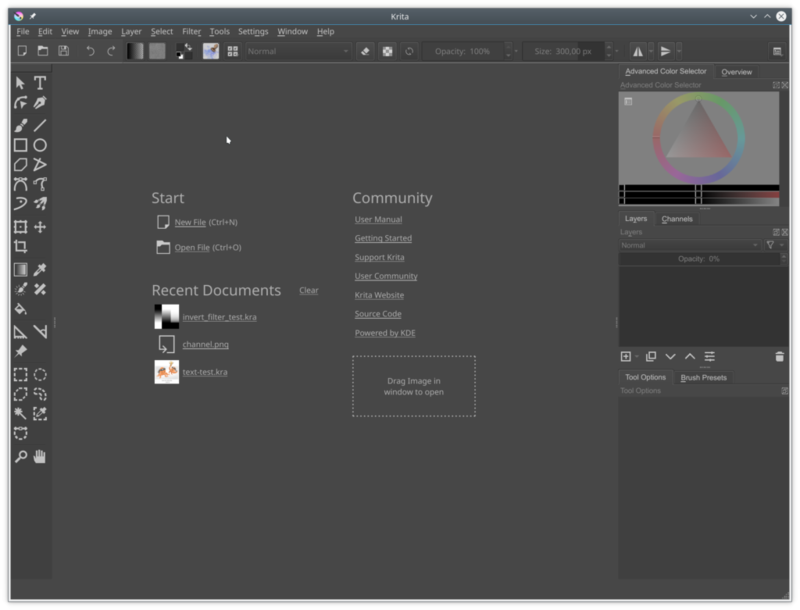 Add the default shortcut for the close action: when opening Krita with an image, the close document shortcut was not available. Fix http link color in KritaBlender.colors: The link are now visible on the startup page of Krita and were dark blue, exact same value as the background making the frame hard to read. Switching them to bright cyan improves the situation. Remove the shortcut for wraparound mode: It’s still available from the menu and could be put on the toolbar, or people could assign a shortcut, but having it on by default makes life too hard for people who are trying to support our users. Set color scheme hint for compositor. This is picked up by KWin and sets the palette on the decoration and window frame, ensuring a unified look. Note for Windows users: if you encounter crashes, please follow these instructions to use the debug symbols so we can figure out where Krita crashes. 64 bits Linux G’Mic-Qt plugin appimage. 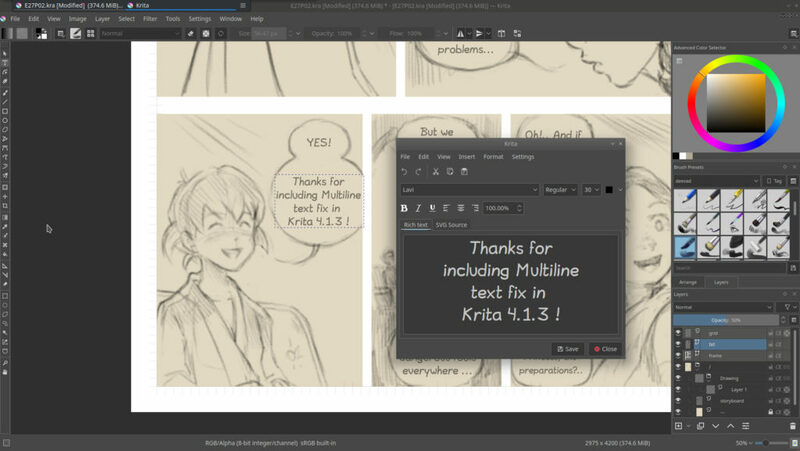 When it is updated, you can also use the Krita Lime PPA to install Krita 4.1.3 on Ubuntu and derivatives. We are working on an updated snap. Note: the touch docker, gmic-qt and python plugins are not available on OSX. 0x58b9596c722ea3bd.asc. The signatures are here (filenames ending in .sig). Krita is a free and open source project. Please consider supporting the project with donations or by buying training videos or the artbook! With your support, we can keep the core team working on Krita full-time.